Colorful planks at the door fronts of this console recreate the look of reclaimed wood. It makes a unique accent piece for any living area in your home. With openings at the back for wires/ventilation and shelves inside, this console can even be used with a TV. The medium brown rustic finish and colorful plank shelf at the base complements the easy-going style of this casual piece with block legs. The Mestler Console with Colorful Plank Doors by Signature Design by Ashley at Beck's Furniture in the Sacramento, Rancho Cordova, Roseville, California area. Product availability may vary. Contact us for the most current availability on this product. 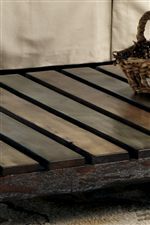 Wood & Finish Made from select veneer and hardwood solids in a medium brown rustic finish. Table shelves have color accented finish for a reclaimed look. Storage ADJUSTABLE/REMOVABLE SHELF(2): 19 1/8"W x 12 5/8"D x 5/8"H. BOTTOM SHELF OPENING: 40"W x 13 3/4"D x 6 7/8"H. DOOR OPENING(2): 17 1/2"W x 14 1/8"D x 11 7/8"H.
The Mestler occasional table collection offers the look of reclaimed wood for a vintage casual design inspiration. The rustic style of the tables contrasts your other living room furniture to create a welcoming place for relaxing and entertaining. The color accented planks add a fun pop of color to complement the overall medium brown rustic finish over select veneer and hardwood solids. The Mestler collection is a great option if you are looking for Casual furniture in the Sacramento, Rancho Cordova, Roseville, California area. Browse other items in the Mestler collection from Beck's Furniture in the Sacramento, Rancho Cordova, Roseville, California area.